MM Design spent a week at the Milan Furniture Fair (Salone Internazionale del Mobile di Milano) which is held annually in Milan, Italy. The largest of its kind in the world, it is considered a leading venue for the display of new products by designers of furniture, lighting and other home furnishings. 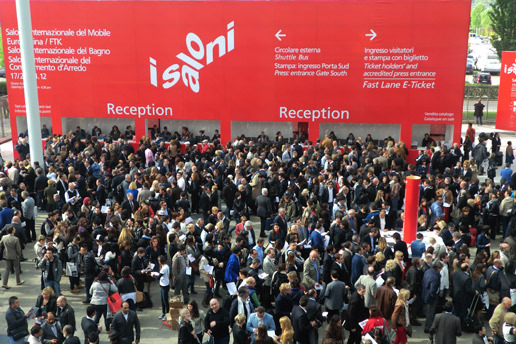 We did not miss a thing - including the Milan convention center, spanning 2,500,000 sq ft of exhibit space, as well as hundreds of satellite shows spread throughout the city center and outskirts of Milan. Inspired by Italian design, not to mention the great food and wine that was enjoyed after-show hours, we returned filled with inspiration and new ideas! *Contemporary kitchen design: white lacquer mixed with natural wood. Sleek designs with hidden cabinet hardware; no backsplashes. *Color: Peacock blue, punchy yellow. Charcoal grey and white. *Interiors: Bohemian-chic, sofas with accent pillows of varying sizes, patterns and textures. *Upholstery: Knife edge detail on sofa cushions. Exposed large stitching on accent pillows.